Will’s and Ben’s blog books/journals printed at Lulu.com. Each are around 100-pages hardbound. Will and Ben have been writing in their blogs for nearly 2 years by now. Will has written over 8,100 words in 204 posts. Ben has written 6,400 words in 155 posts. I told the boys that if they wrote in their blogs (or rather, submitted to me forcing them to write), that I would get a book printed each year from what they wrote. Last year I got a soft-back book from Lulu.com. 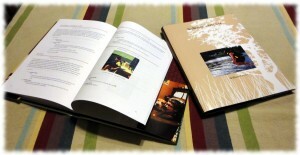 This year I took all of their writings over the past two years and published a hard bound book from Lulu. The books arrived today, and the boys were excited to open them. The books are a sort of journal of what they did over the year. Neither really keeps a journal or scrapbook, so this is a way for them to go back and look at what they did over the past couple of years. We will see what the next year in blogging brings! Hopefully another two books. Now to get moving with getting this blog printed into a book.